Patrick Wayne Swayze was born in Houston, Texas, United States, on August 18, 1952, was an American actor. Young Patrick Swayze began his acting career in the musical Grease, in role as Danny Zuko, on Broadway. He made his big screen debut in the comedy movie Skatetown, U.S.A. (1979) in role as Ace Johnson. He made his television debut in war comedy drama series M*A*S*H in 1981, in role as a soldier diagnosed with leukemia. 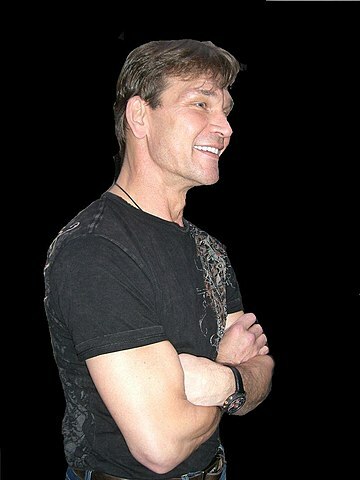 Patrick's breakthrough role came as Johnny Castle in the romantic drama dance film Dirty Dancing (1987), for which he was nominated for an Golden Globe Award. He was nominated for a Golden Globe Award for his performances as Sam Wheat in romantic fantasy thriller film Ghost (1990) and as Vida Boheme in comedy film To Wong Foo, Thanks for Everything, Julie Newmar (1995). He began his professional career as a dancer for Disney On Parade. He portrayed Orry Main in television miniseries North and South (1985). He voiced Cash in film The Fox and the Hound 2 (2006). He received a star on the Hollywood Walk of Fame at 7021 Hollywood Boulevard in Hollywood, California in 1999. He was married to Lisa Niemi (1975-2009). He studied dance and ballet in high school. Swayze died on September 14, 2009, at age of 57. My big regret is the physical damage I've done to my body. I can do almost anything physically and I used to believe I was invincible, breaking bones over and over, playing football, doing gymnastics, diving, ballet, doing my own stunts, kickboxing, staging fights ... It all seems a little stupid to me now.